Transfer to Cedros Island on a private twin-engine plane from Otay Mesa, CA. Arrive Cedros Island in about 2.5 hours. Avoid the lengthy border wait on return! Park for FREE at Brown Field Airport: step out of your car and onto the plane. 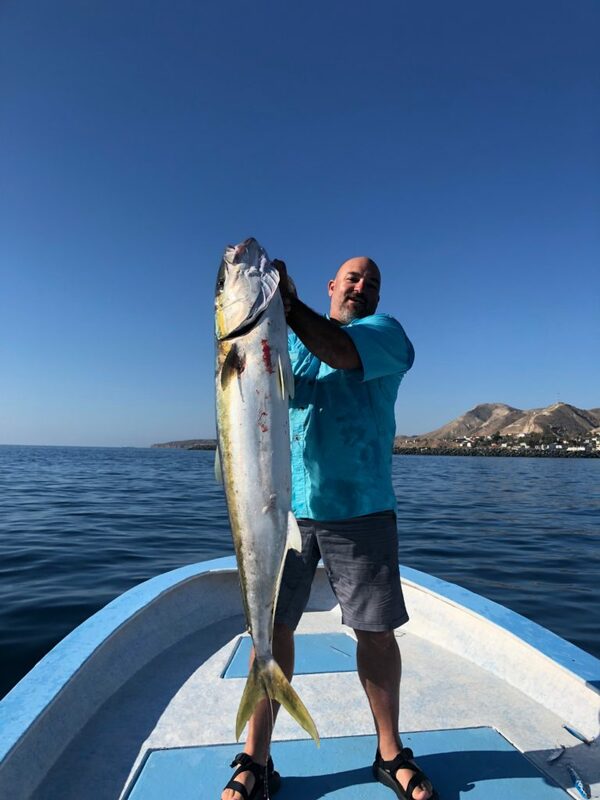 US licensed pilot-guides with extensive Mexico experience. They will assist you through every step of your journey. FISH EVERY DAY. Typical arrival time is between 10:00 and 10:30 a.m. Fish the rest of the first day, up to 12 hours each full day, and a half-day before you depart. Weight allowance: 40 lbs. per person going down. Gear and fish allowance 90 lbs. coming back. Three per panga on 27-28 ft. super-pangas. 2 per panga option: Surcharge is $50 additional per person, per day. Experienced and knowledgeable local boat drivers. Fish 6:00 am until 6:00 pm. Packages cover south and lee side of Cedros Island. Other locations subject to a fuel surcharge of $50. Use our Seeker rods for free (limit 3 per person). All accommodations are oceanfront with decks, ceiling fans, and private bathrooms. Double or triple occupancy is standard, depending on your group size. Single room surcharge: $100 per day (subject to availability). All meals on the island (breakfast, lunch to go on boats, and dinner). Traditional Cedros-style cuisine with a gourmet flair. Meals are served family style, but the menu is customizable, including special diets. Just ask! Bottled purified water and sodas in the hotel and on boats. Friendly staff to prepare your meals, clean rooms, and take you fishing. Filleting and freezing of your catch. Vacuum sealing included! We provide cooler bags for lightweight transporting of your fish back to the U.S.
Free Wifi in all the rooms (but very slow on the whole island). Free calls to the US on the lodge phone. Credit of $30 toward Trip Insurance. COA does not provide trip insurance, but we recommend you purchase it. Trip insurance is the best way to protect against loss due to travel interruptions out of the control of COA and which COA will not reimburse. Mexican Fishing License: These can be purchased at some tackle stores in the US or online. Mexican Tourist Permit for US citizens. You’ll get this at the stop you make to clear Mexican customs. When arriving by air, you will need to purchase a 90 day visa for about $28. You will pay an exit fee of about $5 USD when you leave Mexico. Beer/wine/alcoholic beverages: you may bring or purchase at the island. Fishing gear. Other than the Seeker Rods included, please see recommended fishing gear. Gratuities. Click here to learn more about our crew and tipping. Round trip transportation to Cedros Island. Ground transfer from Otay Mesa, CA to Ensenada, BC, Mexico then flight from Ensenada to Cedros Island on a Mexican regional airline. Weight allowance: up to 25 kilos (about 50 lbs.) of luggage, gear, and fish free. Above that, it costs about $1 per pound payable to the airline company. NOTE: The Ensenada flight does have a weight limit. You may be limited to about 90 lbs., TBD by pilot. 2 Rods fly free. Additional rods $7. The plane can not accommodate rod cases, instead, we recommend you use pipe insulation to protect the tips of your rods. Three per panga on 26-27 ft super pangas. Single panga option: Surcharge is $180 per day (subject to availability). 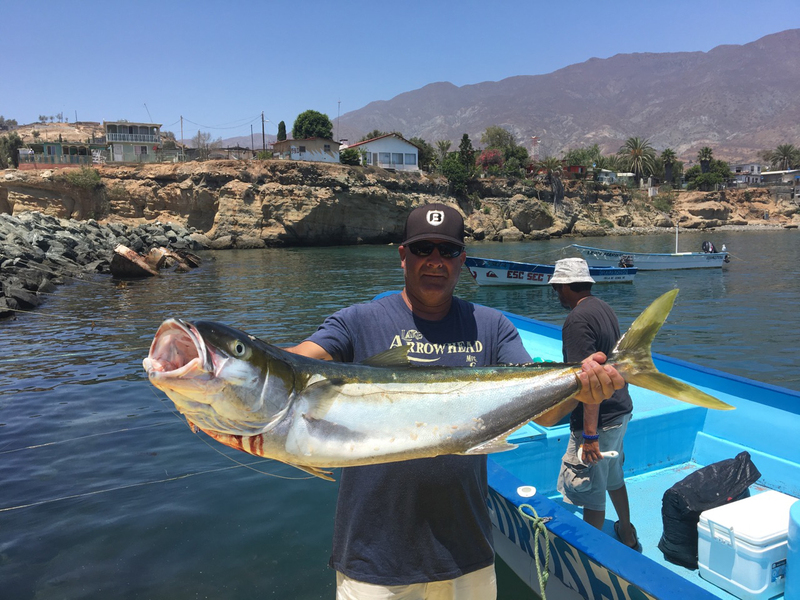 Packages cover fishing on the south and lee side of Cedros Island. Other locations subject to a fuel surcharge of $50. Comfortable accommodations at our lodge. Lodge rooms are extra large with 3 beds. All accommodations are oceanfront with decks and ceiling fans, and private bathrooms. All meals while on the island(breakfast, lunch to go on boats, and dinner). Traditional Cedros-style cuisine with a gourmet flair. Meals are served family style, but the menu is customizable, including special diets. Just ask! Purified water and sodas on the hotel and boats. Friendly staff to prepare your meals, clean rooms & take you fishing. Filleting and freezing of your catch. Fish will be frozen in Ziploc bags while you’re on the island. We provide cooler bags for lightweight transporting of your fish back to the U.S. Vacuum sealing available for $1 per bag (2-3 lbs.). A credit of $30 toward travel insurance. Travel insurance is a good way to protect against loss due to travel interruptions out of the control of COA and which we will NOT reimburse. Mexican fishing license. These can be purchased at some tackle stores in the US or online. Mexican Tourist Permit for US citizens. You’ll get this at the stop the van will make to clear Mexican customs. Ask for the free one week visa. Vacuum sealing. Available for $1 per bag (2-3 lbs.). Beer/wine/alcoholic beverages. Bring or purchase at the island. Fishing gear (other than Seeker Rods). 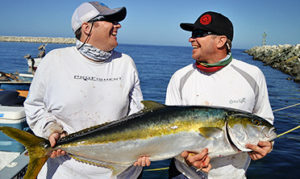 Look at our Recommended Fishing Cedros gear. Airline rod fee. After the first 2 rods it’s $7 each. Airline overweight fees: above 50 lbs the cost is 25 pesos per kilo (about $1.00 per pound). Max weight limits may be set at 90 lbs. per person.